Temple Institute decries American-brokered deal between Israel, Jordan and PA to install CCTV on Mount to prevent Jewish prayer. Jewish activists are up in arms over a new agreement between the Israeli government and Jordan, which would not only cement Muslim control over the Temple Mount - Judaism's holiest site - to the exclusion of Jews, but would also see CCTV cameras installed to catch Jews praying there. In a statement Sunday, the Temple Institute said it "deplores" the US-brokered agreement regarding Jewish visits and prayer on the Temple Mount, which bolsters Jordan’s custodian rights on Israel’s holiest site via the Islamic Waqf authorities and reaffirms that Jews will not be allowed to pray there. Rabbi Chaim Richman, the Institute's International Director, accused the government of essentially legitimizing the narrative of Muslim extremists, who claim that the Al Aqsa Mosque on the Mount is "threatened" by the mere presence of Jews. "The Prime Minister has rewarded Islamic terrorism by empowering and institutionalizing the discrimination of Jews on the Temple Mount," Rabbi Richman stated. "Instead of stating unequivocally that the recent violence and murder of innocent Jews has nothing to do with peaceful Jewish prayer, the Prime Minister has bolstered the false Islamist narrative by agreeing to place cameras monitoring Jewish visitors' lips on the Temple Mount and reaffirming that Jordan, and not Israel, is the sovereign ruler over the Temple Mount, the heart of our people." Full details of the plan are not yet public. 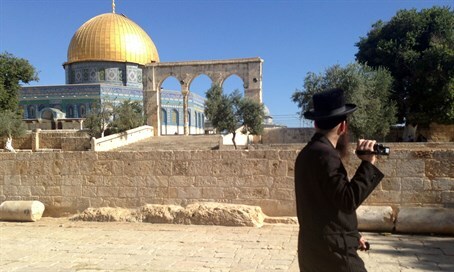 Under the agreement Waqf officials will review the footage to ensure Jews do not dare pray on their holiest site, while Israeli police will use the footage to track the activities of Islamist extremists who regularly harass Jewish visitors. The agreement was made in coordination with the Palestinian Authority as part of efforts to calm escalating violence - specifically, a string of Arab terrorist attacks targeting Jews - but some PA officials have actually voiced their opposition, and the Palestinian leadership in general has not taken any apparent steps to end its campaign of incitement against Israel.